Happy July! Today is my 28th birthday, and we’ll be celebrating with tacos, margaritas, and a concert with good friends. After a long and exhausting weekend of packing, moving, unpacking, and then repacking so that the painters could paint, Dan and I are ready for some relaxation, fun, and tequila. And queso, of course. 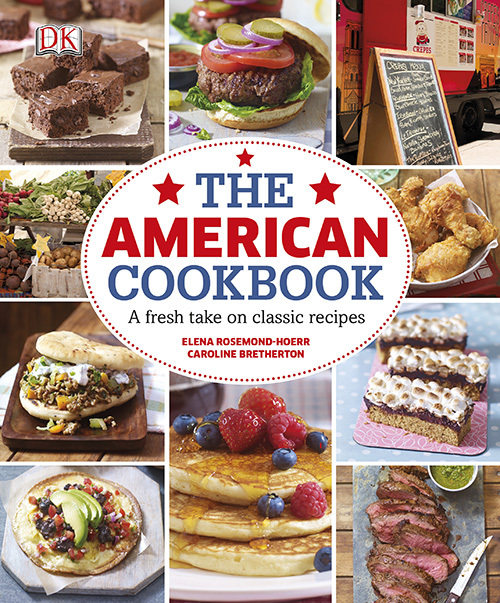 I thought that today, in honor of one of my best days of the year, I’d share one of my favorite recipes from The American Cookbook. To be totally honest, this is one of my favorite recipes from life. On average, since we learned how to make them in 2008, Dan and I have eaten huevos rancheros at least once a week. We spent years perfecting our method and so I was thrilled when the recipe made it on to the content list of the cookbook. It’s simple, easy, and so delicious that on more than one occasion Dan and I each finished our plate and then fried up another serving. Worth it, every time. I eat something different every year, but I always have blueberry mountain pie for dessert. It’s a family tradition started by my grandmother, Bobbie. I can’t wait to hear all of your traditions! Winners will be selected randomly on July 12, 2014. Good luck! This giveaway is closed. Congratulations to Tommy, Carm, Becky, Alex, and Caitlin! 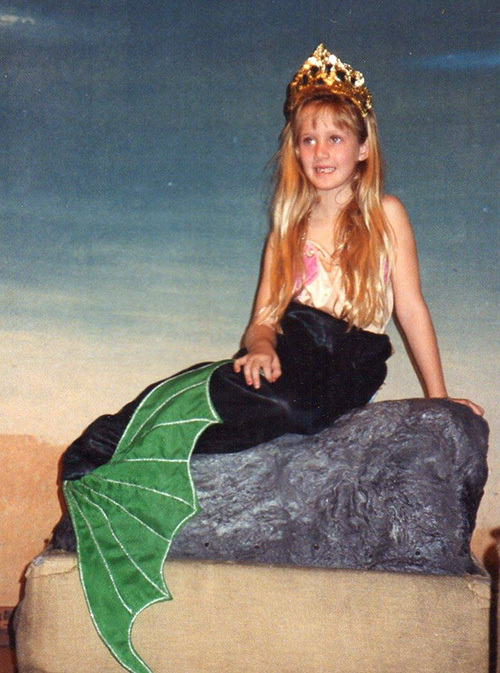 And, for posterity, a picture of me as a mermaid, circa sometime in the 90s. 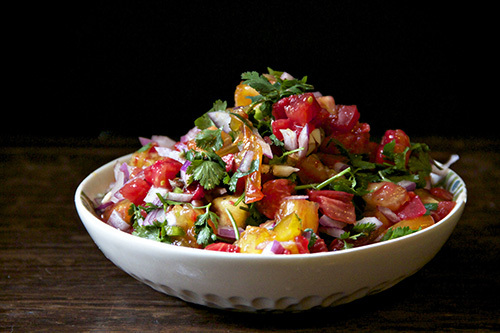 Combine tomatoes, jalapeno, red onion, garlic, cilantro, salt and pepper, and lime juice in a mixing bowl. Mix well and set aside. In a medium sauce pan heat black beans, in liquid. Stir in smoked paprika, salt, and pepper. Heat oil in a heavy pan over medium heat. When the oil is hot place tortilla in the center of the pan. Make a ring of shredded cheese and crack an egg into the center, containing the egg. Let cook until the cheese has melted and then use a spatula to flip the tortilla and the egg. Let cook for 2-3 minutes for a runny yolk or 4-5 minutes for a firm yolk. 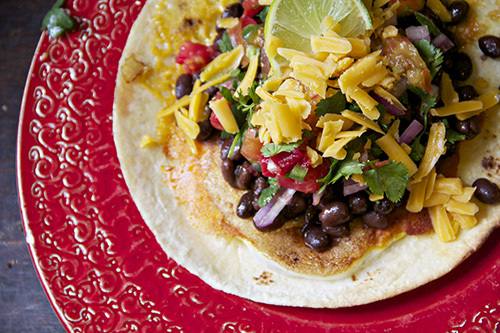 Use a spatula to lift the tortilla and the egg, flipping egg side up onto a plate. Repeat with remaining ingredients. Thickly slice avocado. 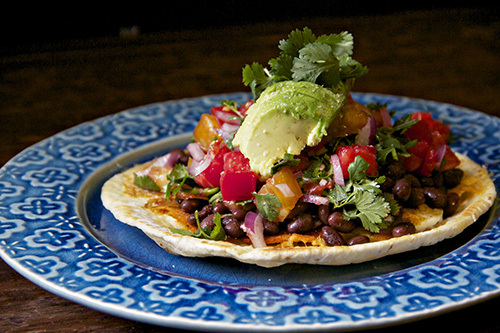 Strain black beans and top tortilla and egg with black beans, pico de gallo, and avocado. Tips: Use a wide spatula to flip the tortilla so that the egg is cradled in the middle, helping to keep everything together. Flip quickly and confidently! My mom always made me strawberry cake for my birthdays. Of course I insisted on the pink boxed cake mix and the electric pink frosting from a can. Now I tend to go for slightly higher-quality materials, buy a store bakery cake, and one year even had an amazing version from an upscale bakery, but nothing says birthday to me like strawberry cake. This looks incredible, can’t wait to try it soon. And Happy Birthday! Each year, my mother bakes me a different kind of birthday cake. I never know in advance what it is, and half the fun is guessing what flavors are in it and thereby determine what type of cake it is. Some of my most memorable ones were Death by Chocolate, Jamacian Surprise Cake (a pineapple upside down cake with rum), and a triple peanut butter cake featuring 4 different uses of peanut butter (my favorite!). Chocolate Cake with Chocolate icing! It’s not a birthday without it. Hmm… I guess I don’t have a birthday *dinner* tradition, except for the fact that I get to pick where we go (or what Dave makes). The past few years we have kept up a tradition of going apple picking for my birthday – since it’s in the fall and typically right before Rosh Hashanah, when it’s tradition to eat apples & honey. I SO love huevos rancheros. Any excuse to have salsa at breakfast, actually! My breakfast tradition is always something full of olives or pickles. Salty salty salt. And no guilt about dessert. And wine! and a cocktail first! Basically, all the things. But no guilt. Yes!! No guilt is the key to a successful birthday. German chocolate cake! I always sneak a couple of bites of the icing as it cools in the fridge. No real birthday tradition, but we do always go out for a nice dinner. We always go out for dinner somewhere for my birthday. Usually a nice seafood dinner! Growing up, my mom always made me french toast for breakfast on my b-day. I continue that my whipping up some for myself every year. I always make my own cake. This makes my family crazy because they don’t think a person should “have to” make their own birthday cake, but I love to bake, so it’s a treat to myself to choose a cake I’ve been wanting to make but haven’t had a reason to, and make it just for myself. German chocolate cake – the birthday cake of choice for FOUR generations in our family! Happy Birthday to you! Lately, tiki drinks at Trader Vic’s have been on the menu for my last two birthdays, and there is ALWAYS salsa dancing. As far as food goes, I must have a good old chocolate cake with chocolate frosting and sprinkles – the kind whose recipe comes off the back of the cocoa powder tin. Perfect! I also have birthday pie instead of birthday cake. Mine is usually apple or pumpkin since my birthday is in October. About ten years ago my dad started making homemade iced cream so we try to add that into each birthday celebration as well. My birthday is December 26th. For years when I was young, I usually just ended up getting a couple candles stuck into whatever leftover Christmas dessert was lingering around after the holiday carnage! Chocolate! In any way, shape or form. When I was a kid, that clearly meant chocolate cake and ice cream with a chocolate mix-in (like mint chocolate chip! yum! ): last year the tradition continued, but as a mole sauce at my favorite south-of-the-border restaurant! Dinner with my family at my grandma’s cabin in northern MN. Even now that I’m living in North Carolina, I’ll be flying home for that dinner. Tradition : Confetti angel food cake and peppermint stick ice cream. Winter birthday. My tradition is baking cake with my friends and cooking tortillas! And listening to good music and taking a lot of photos! My birthday is in January and I grew up in snowy areas so my mom always made me a snowWOMAN for my birthday. She also had these adorable ceramic birthday candle holders that were little kids skiing, sledding, and doing other winter activities. She would often make a cake that looked like a snow covered mountain and arrange all the kids on it. She gave them to me a few years ago, but sadly, neither of my kids have birthdays during the snowy time of year and I never seem to have time to make myself a cake. Going out to eat is my birthday tradition. My birthday tradition in high school was to go to the beach with friends and eat our weight in potato chips and ice cream. Since I’m no longer living near a beach, my tradition now is eating good food with people I love!